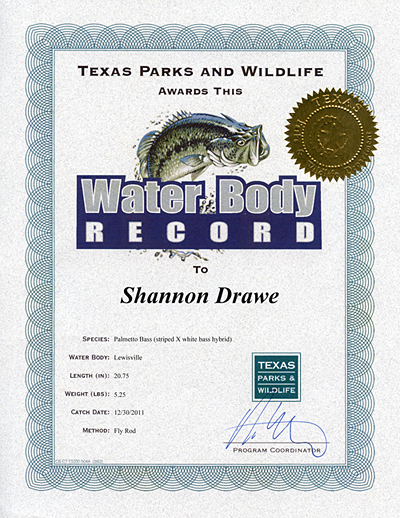 The fish gods shone on me on the next to last day of 2011, and I was able to put one new waterbody record, recognized by Texas Parks and Wildlife Department, in the books for Lewisville Lake, Texas, for a palmetto bass on fly rod. I found a nice spot with a natural wadeable area where the old Lewisville Dam was cut long ago back in early November, and drove down to hit that a few times when the wind surprisingly switched out of the north to the south. It created a natural funnel that tightened the bait run, and every evening, just before dark. it was on. And it yielded just about every fish under the sun; active and fat largemouth, sand bass, crappie, and on one trip a nice hybrid. One of my guests to that spot scored her personal best largemouth bass, and whenever it warmed (way above averages), the action was downright good. 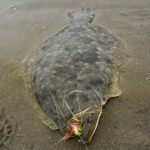 I decided to take the time on December 30 to go back and just see if the hybrid was a fluke. The weather has to be just so, and by now this “wadeable” spot is three or four feet deep (that could be even better). It was a bit cooler than usual, but I tied on a shallow black/black jig-hook Clouser and let it fly. Big enough to be worth recording, a 5.25 pound palmetto bass caught on Lewisville Lake, Texas. A hybrid take is much like a striper’s take … only better. Hybrids, or palmetto bass, have a “never-say-die” attitude that can include finger biting to the point of leaving a mark. Now that’s a fish. When they get close enough to see you, get ready for chapter two, because it’s on again. That’s just in their jumbled DNA. 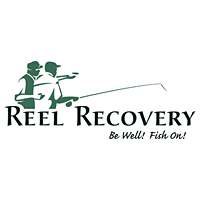 I was only after one fish, and after about thirty minutes, I felt that wall grab my fly. 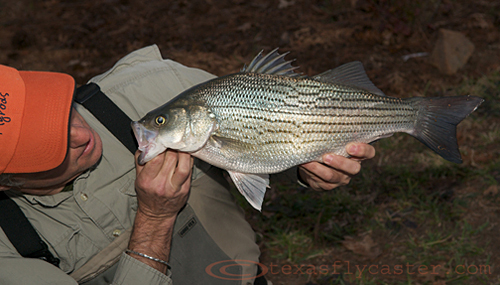 After a typical five minute tussle I was able to land the lake fly rod record for Lewisville Lake, Texas. Now, make no mistake, this is not a big hybrid by lake standards, and the ten pound hybrid I caught at Ray Roberts Lake Dam came out of Lewisville and swam all the way up the Trinity to the Dam. Now that was a fish! That ten pound hybrid would have been a Texas State fly rod record, but went undocumented for reasons out of my control. As I recall, that fish had a 17″ girth! This is one record I will spend some time trying to get closer to a double digit – if that opportunity comes around again. Can you tell I like palmettos? Just let me know what record you’re after and where you want to go get it! TPWD really makes it fun through their system of awarding these records. Congrats man, nice job … I would like to land a TPWD record someday … nice credential to add to the life list.